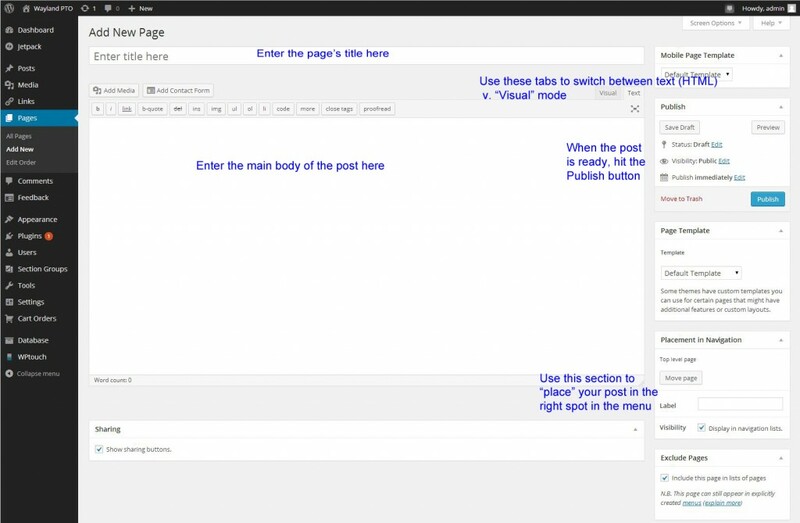 There are two ways to add a page – one is to hover over “New” at the top of the screen and choose Page, and the other is to choose Pages from the left-side panel and choose Add New. The big open box is for the text of the post. There are two ways to enter the body of your page – in visual mode (easiest if you’re not very familiar with HTML) or text mode (which if you’re comfortable using, then I probably don’t need to explain it to you). You can toggle back and forth between these modes by switching tabs (at the top right of the box). If you’re in visual mode, above the open box is a series of (hopefully familiar) formatting buttons so you can make your text bold or italic or idented, etc. If you want to add a link, select the text you want to make a hyperlink and hit the link button (top row to the right of the alignment buttons).